Kesari has started slowly on Tuesday (6th day) morning shows as early samples are coming in. This is been the norm and film has shown good growth in later half of the day. Kesari has opened to around 12% occupancy in morning on day 6. Samples are from multiplexes only. For the same samples Monday opening was around 15%. Film is trending decent as if now and let's see how things unfold today. Kesari has collected 86+ crore nett in first 5 days. Film is all set to touch 90 crore nett mark on day 6. Film will touch 100 crore mark either on day 7 or day 8. Another big drop, the movie is running out of gas and many of the centers are already burnout. Akki movies used to had a lots of gas in them to go the distance before but now after Padman they burnout fast. His usual big jump that use to come on Saturday did not come with this movie so next Saturday the big jump might not come. There is also a really stupid looking movie junglee coming out where everyone looks stupid even the snake and the elephants. The movie stars flopstar vidyat . He may be a flopstar but his movies do make 20cr to 25cr and are hit on TV, he doesn't make invisible or irrelevant movies like nawaz. Who know the audience might come and watch a good old fashion movie whose aim is to just entertain lol. Kesari is made on a budget of 80 crores with 20 crore for print and publicity.So if the movie collects 100 crore it is a HIT, and if collects 125 crores it is a SUPERHIT. And it will easily collect over 125 crores. 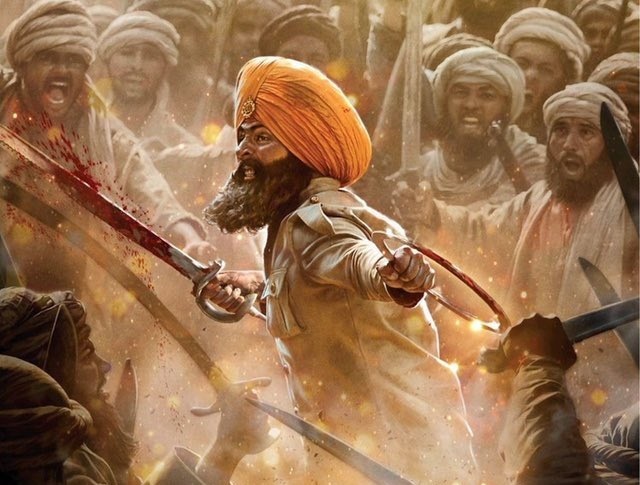 Now Kesari had a fractured, half day release due to Holi celebration and many multiplexes accross the country were shut, Kesari just got 3600 screens when other Superstar films get 5500-6000 screens, a lot of the Muslim population did not turn up due to the controversial content, board exams and school and college exams kept lot of children and family audiences away and IPL started on Kesari release weekend and it massively affected audiences on the release weekend.Now with all these hurdles it still is a success already and will achieve SUPERHIT status in the next few days.Now that is true Superstar power. The power of Superstar Akshay Kumar. Hats off to Bharat hriday Samrat Superstar Akshay.